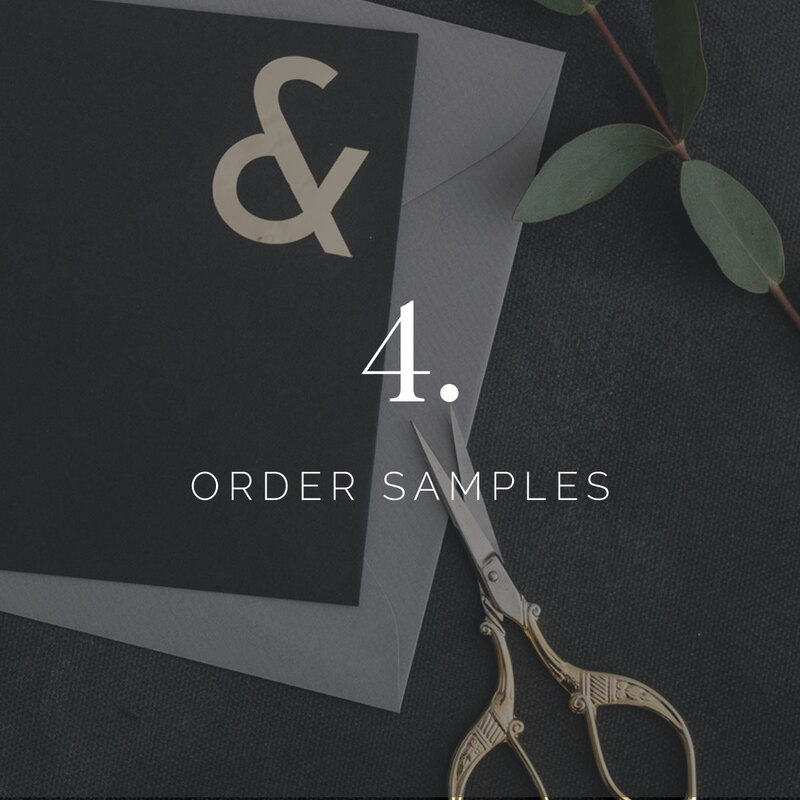 Due to the custom nature of our invitations, orders are created bespoke for you. Absolutely, you can order a pack of samples right here. The Sample pack includes a selection of suites and all of our printing methods. It costs £15 including worldwide postage. We suggest one invitation per household, couple or individual, plus an extra 15%. This 15% allows for keepsakes and any last minute additions – as reprints can be very costly. What does the cost of House Collection invitations include? Each semi-custom invitation has personalised, hand drawn calligraphy elements. The cost of invitations covers full personalisation, calligraphy, colour options, design elements, printing and hand finishing. Depending on the printing method we suggest that you allow at least 6 weeks for design and printing. 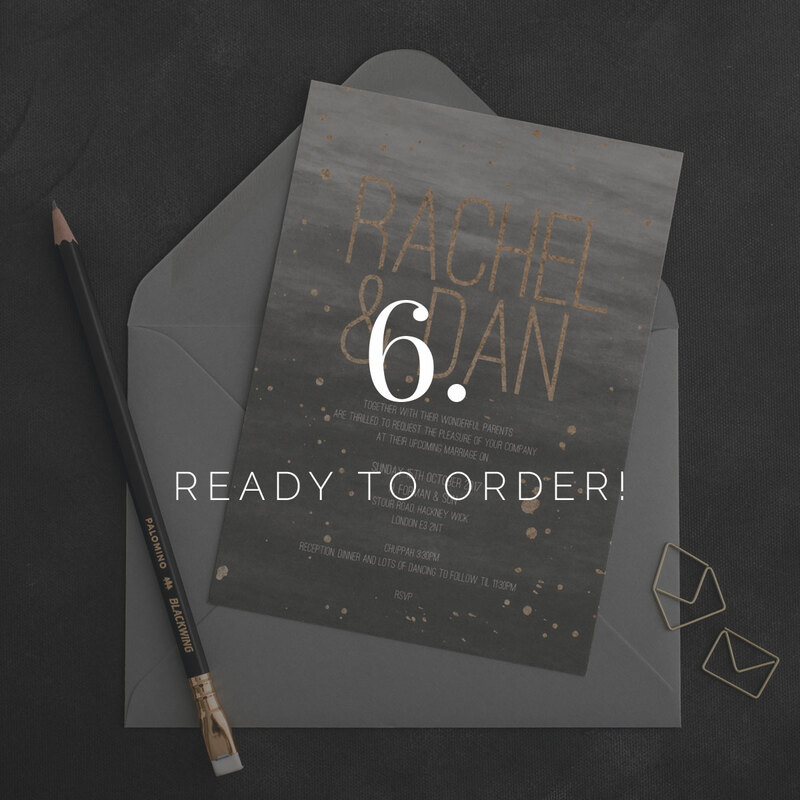 For our hot foiled invitations, we use colorplan 540gsm boards or on to a digitally printed 350GSM card. Digital Foil invitations are foiled onto duplexed- double thick -smooth stock. For digital printing we have a huge range of papers and special finishes and we will suggest the best options. As standard the calligraphy will be customised with your names. You also can customise all colours and wording of all semi-custom invitations. Fonts can be changed if required, although we have chosen the typefaces we believe look the best with each design. 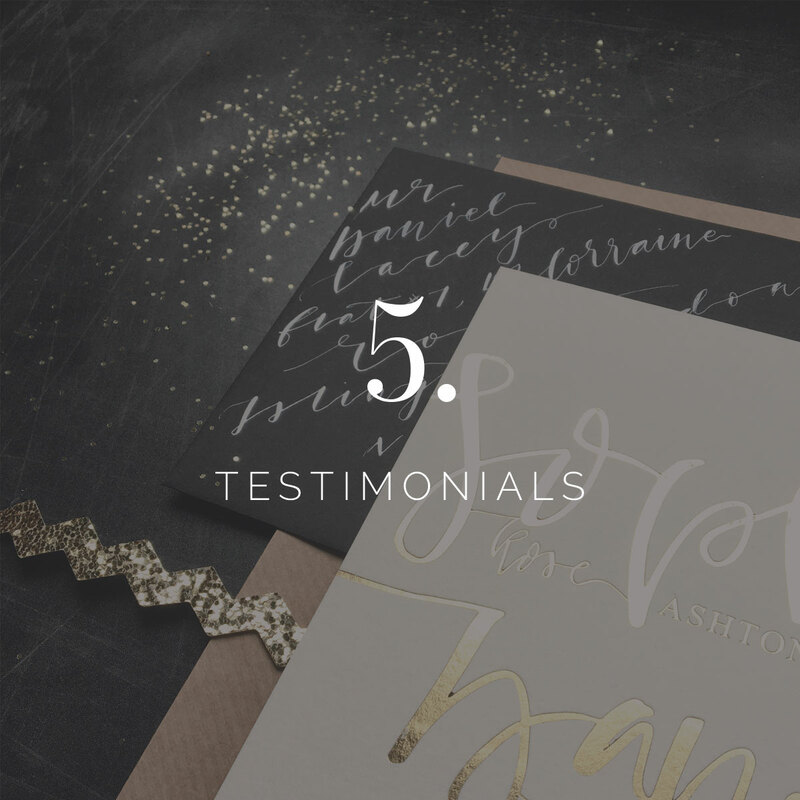 For a flat fee of £50, design elements can be changed for all invitations – please get in touch to discuss your requirements. Can I make any changes to a customisable suite? All customisable suites have calligraphy, colours and text changeable included in the cost. For additional changes such as a design element or wedding logo there is a flat fee of £50. What are the different printing methods? Hot Foil – Similar in process to letterpress, hot foil leaves an embossed impression on the card, but foil is used instead of ink. This allows an enormous colour choice, from classic metallic foil though to neon, matt and holographic foils. Digital Foil – A more budget conscious alternative if you would like to add some extra bling. Digital foil has a mirror finish and looks really striking. Digital foil comes in a range of metallic options. ​Digital printing – also known as flat printing is a full colour process using a high volume printer. Can I Have a digital-only version to print myself? I’m afraid that we don’t create printable PDF’s. What if I need other elements that you don't show here? We can design this for you! Please get in touch. Can you copy this design for me? Due to copyright infringements we will not copy an existing invitation created by someone else. We are happy to use an idea as inspiration for a bespoke suite.